Welcome back speaker Jill Ozovek to the blog! Jill (CPC, ACC, ELI-MP) is a Certified Professional Coach who works with millennial women on finding their dream job when all signs point to the impossible. Through highly tailored group work and one-on-one coaching sessions, Jill focuses on helping clients uncover what it is they want to do with the rest of their career, even when they walk into their first session with no earthly idea. She then helps them craft a plan to transition to the new career while keeping wellness and sanity top of mind. She first shared her knowledge with us in her blog, “Why Wellness Is The Critical Component For A Career Change.” Today, she’s back with more practical tips for getting started. 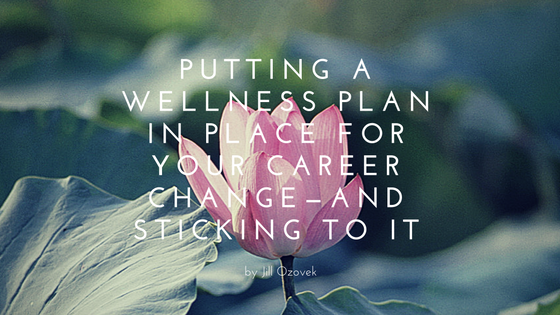 For more info on your own career change, click here, or read on for her four tips on how to include wellness in your plans for a career change. Last time on the WELL Summit blog, we talked about why keeping mindfulness top of mind during your career change is KEY. Without the physical, mental and emotional benefits of a solid wellness plan, it can be tempting to give up on your goal before you even get started. And that’s all well and good, but how do you actually implement a wellness plan that you can stick to? This question can be especially daunting for those of us who don’t have anything in place or those of us who tend to get overwhelmed by a wellness regimen, so I’d like to offer you some suggestions that have worked for me and/or my clients. Remember, it’s important to find what works for you and there really is no one size fits all solution. Schedule It In. Wellness isn’t at the top of a lot of our minds. So how do we make it more routine, especially at first? Make a date with yourself! I make a meeting with myself to attend a class and put it on my calendar. This means I can’t be booked by clients or other meetings. It is JUST as important, if not more so, than any other appointment I have. I also make sure to sign up in advance for classes I’m going to take so it’s ‘official.’ Plus most studios have a cancellation penalty of $10 or more if you cancel too close to class time, so that added sting can help hold you accountable. OR, better yet, schedule it with a buddy so you hold each other accountable for going! You don’t need to start going 7 days per week from the get-go; instead, try first for 2-3 times per week if you haven’t done much up til now. If you go Saturday and Sunday, then that means just once during the busy work week! You can adjust and increase the intensity and/or the frequency as you get more into it. Don’t Force Uninteresting Exercise. Maybe everyone you know is doing Crossfit, but you don’t quite get the appeal. Or maybe you’re not meant for certain types of exercise. For me, if someone told me I had to run, I would never do it. Why not try a couple of different types of exercise a few times and see what you like? One of my clients tried running and the regular ol’ gym and found herself bored. It was only after trying Zumba that she became hooked, and she never looked back. Bottom line: Give yourself permission to say ‘no’ to the types of exercise that don’t work for you. Batch Your Cookin’: Many of my clients have adopted this hack I have been doing for a while now to save me time and money. I got a slow cooker (and yes, I use it in the summer too) and I plan two simple meals per week that I can take to work. I make it minimal to prep and Google things like “healthy and easy slow cooker lunches,” “low salt slow cooker meals easy,” or “slow cooker vegetarian meals” (if I’m trying to cut back on the meat). Keep track of ones you like by posting them to Pinterest and run out to the grocery store once weekly, meals needs in hand. I spend Sundays with the slow cooker and get the meals done while I’m doing other things and then I’ve got healthy lunches for the week! Voila! Making a commitment to scheduling it in is important. Since I’ve made the decision to do this rather than buy out all the time, I’ve started doing a little less running around on weekends so I don’t feel so scrunched for time. At first it was an adjustment- I love seeing friends! – but now I wouldn’t go back. Plus there are other times and ways to catch up with loved ones. Clear Your Mind: This one, especially for those of us living in big cities with lots of hustle and bustle, can feel fleeting. But rampant thoughts and frenetic thinking and checking of social media and email can ultimately derail us from our goals, either because we can’t focus or because of the FOMO and feelings of “less than” that checking social media like a maniac can elicit. Try to cultivate some sort of daily habit in the mindfulness department. This could be meditating 5-10 minutes a day with an app like calm.com or Insight Timer (which ties you to others meditating around the world), it could involve writing daily in a journal or on a site like 750words.com (that keeps you accountable), or it could be starting a daily gratitude and daily intention diary. Or it could be a combo of any and all of the above or something completely different that helps YOU clear YOUR head. Remember, this is all for naught if it doesn’t work for you, but I urge you to try something more than a couple of times to really decide that. Anything you do for the first time will feel foreign and can be difficult to really see the benefit, so try it for a week or so and then decide. These are some ideas to get you started on your career change journey! We’ll be talking more about this at the W.E.L.L. Summit in October. In the meantime, what other techniques have you been wanting to try but aren’t sure of? Let us know in the comments below! Learn even more about Jill and her tips during her W.E.L.L. Summit session, Working W.E.L.L: How do you know it’s time for a career change?